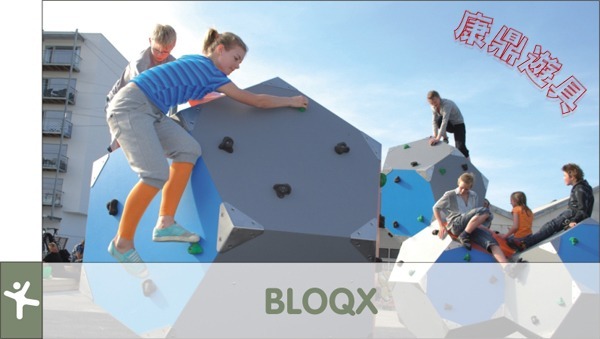 BLOQX is not just a playground, a sculpture, a climbing wall or a meeting space! BLOQX is an attractive hot spot for children, teenagers and adults to hang out in urban and suburban locations. Furthermore, it is a design concept that is intriguing, tough and designed to get us moving and have some fun! A 3 dimensional and safe environment that gives an opportunity for young climbers to develop their climbing skills nearby, while the geometric forms gives easy access to a whole new climbing experience. Once you are at the top, the saddles become the perfect hangout zone to get together and check things out. The contrasting colours of light blue and orange produce a crisp and exciting design that attracts the user and fits well into the residential environment. It is a modern sculpture that perfectly suits the urban environment and appeals to everyone. Furthermore, the variety in plate colour and climbing grips allow the user to invent routes and challenge each other. Not to mention the fact that the few parts and quality materials make BLOQX easy to install and maintain. BLOQX was developed in cooperation with some of the world's best climbers combined with the involvement of many young people. This gives BLOQX the advantage of being a place for all regardless of their level of skill or ability.